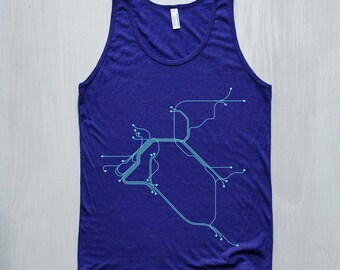 Announcement NEW in the shop, our NYC transit design on a canvas tote! Screen Printed in Brooklyn, NY. 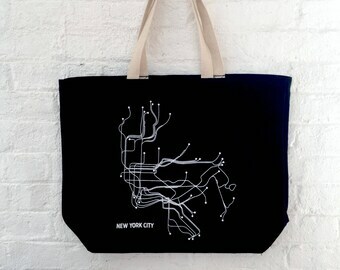 NEW in the shop, our NYC transit design on a canvas tote! Pair them together to make a statement wall in your apartment, home or office. 18"x24" prints rolled in tubes for safe travels! LinePosters is a collaboration between graphic designer, Cayla Ferari and engineer, John Breznicky. When we set out to find transit inspired artwork for our first apartment together, the search came up empty. Cayla had created an illustration of the NYC subway that we decided to have made into a 4' x 6' wall decal for our living room. After receiving compliments from our family and friends, we decided to design our first product together: a black and white offset poster.After spending the summer of 2011 selling from card table throughout NYC, it became clear that what started as a hobby, had turned into a business. Now with a growing inventory of additional city designs and products in the works, LinePosters hopes to reach a wider audience while continuing to deliver well designed, high-quality items. Unfortunately, very sadly, we cannot custom print. A great deal of time and material set up is involved with our processes so everything must be printed in larger quantities. Producing items this way is what helps us keep them affordable. However, LinePosters is a growing company so there are a lot of new options yet to come. Stay tuned for new color combinations and new cities down the road. We do wholesale! Contact wholesale@lineposters.com with some information about your store, where you're located, and which of our products you're interested in carrying.